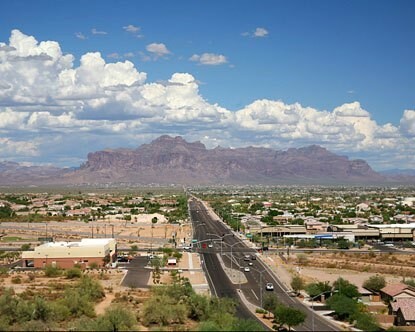 The third largest city in Arizona, Mesa is home to more than 440,000 people and growing every day. While the town’s history can be traced back centuries, it wasn’t until the late 1800s that Mesa, AZ finally began to form into the city we know today. This history can still be seen in the archeological sites that attract visitors on a regular basis, one of them the Mesa Grande Ruins. Mesa is a cultural center of Arizona, with plenty of activities year-round. The Mesa Arts Center and Mesa Amphitheatre present concerts, shows and exhibitions all year round. Popular museums in Mesa include the Arizona Museum of Natural History and the Commemorative Air Force Arizona Wing Aircraft Museum at Falcon Field. Mesa is a mecca for golfers, featuring numerous championship golf courses. These include Alta Mesa Golf Club, Coyote Run Golf Course, Dobson Ranch Golf Course, Augusta Ranch Golf Club, and dozens more. The 1,146-acre Red Mountain District Park offers ball fields and picnicking, while Usery Mountain Regional Park is known for trails, archery, camping and more. Drivers in Mesa want to trust their car care to hometown professionals, like those found here at Mercie J. It’s our goal to provide you with efficient, high-quality auto repairs and service for the life of your car. Visit our convenient location today and discover what our experience can do for you. We’ll have you back out on the road in no time, enjoying everything Mesa has to offer.